Das Feid Baug – Who Dried My Jeans?! On March 29, 2015 March 29, 2015 By Who Dried My Jeans?! How about I just tell you the story behind its development? By the way, I never learned German but it has never stopped me from “speaking it”. I have recently really been stepping it up with my dinner prep and meal execution at the table through completion. I’ve sautéed, broiled, baked, and Crock-Potted. I’ve shredded, diced, and I think Julienned one time by mistake. I’ve beat, stirred, and folded more than just the laundry. 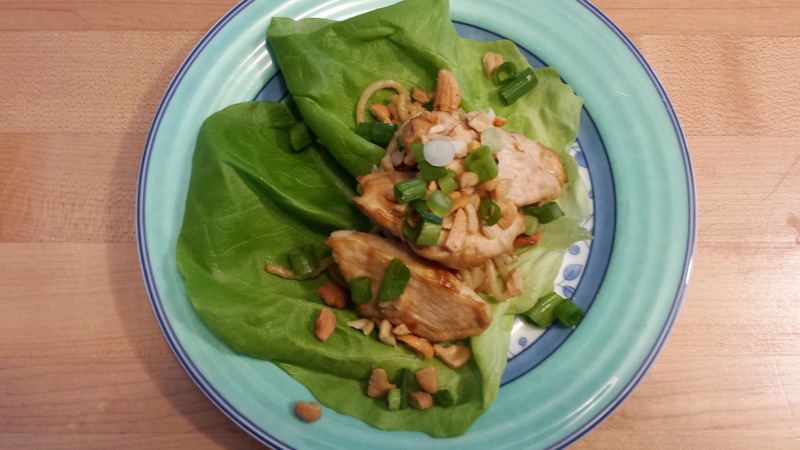 Thai Peanut Chicken Lettuce Wraps with cashews and green onions-just in case you though I might be lying! However, like Haley, who is 3 and is suffering from a recent “Frozen” relapse, I have tendencies to backslide. I thought we had finally “Let It Go” but she just couldn’t “hold it back anymore”. Step 1: I am fully aware and finally admitting that I have a problem. I always underestimate how long it takes to get things accomplished and always try to do just one more thing before its time to get ready to leave the house. NOTE: If the next 11 steps of the recovery process are as challenging to complete as the first for this bull-headed Taurus, I’m doomed for a life of last-minute rushing. Sophia had to be at dance at 5:30 and Rick doesn’t get off of work until 6:00. In his absence I was tempted to hit the drive-thru but I knew it would be the first step down the slippery slope into the grease pit of the fast-food world. I was aware that I had hit rock bottom one day when I found myself throwing away Burger King trash in the drive-thru at Wendy’s. I was convicted and I couldn’t handle the shame any longer. I was angry too, that I had been brainwashed into truly believing that alternating between oblong, round, and crown-shaped chicken nuggets was considered appropriate diet variation. With or without Rick, I was adamant that we were going to calmly eat our dinner together, at the table, and discuss our days, whether they liked it or not! Knowing Rick’s seat at the table would be empty I did alter my menu and made a double batch of Horizon Organic macaroni and cheese and served it on mismatched flatware. Like usual, I did set a napkin to the left of each of their bowls, knowing I would pick them up again following the meal untouched. The mac and cheese streaks, along with their snot, always washes off their sleeves on laundry day. By the way, my children prefer Horizon Organic over Kraft 2:1. Plus it’s often 10 for $10 at Kroger. I think Harrison votes for Kraft because he likes the way Red 40 makes him feel. How else could they get that unusually bright “cheddar” color? It has to be Red 40. ***Can just one person please tell me that motherhood has caused them to suffer from expressive aphasia? And that it happens so often your family can translate your jumble and they rarely make fun of you anymore because they already know you worry about being crazy?!!! “Same page”, I said to myself! Haley and Harrison were strapped into their seats. My co-pilot, Sophia, served Harrison his mac and cheese in the third row and put our bowls in the cockpit while I served Haley. I looked at my 3-year-old and said “you can do this right”? My words were accompanied by an encouraging head bob and raised eye brows. Time was ticking and Sophia’s cake was about to start. Haley looked at me with a face that said, “I’m going to try my best Mommy, to hold this bowl with one hand and eat with a spoon in the other; a task that I can find challenging at best while sitting still at the kitchen table. 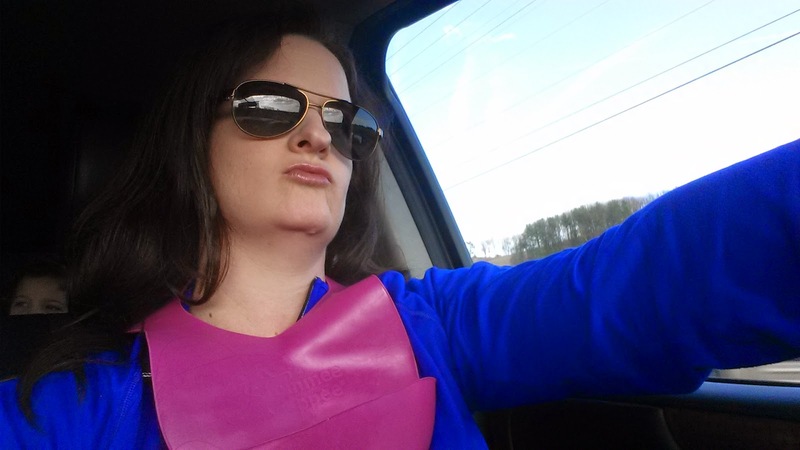 Not to mention the difficultly of leaning forward to take a bit while strapped in a 5-point harness and weight shifting left and right trying to counteract your erratic driving.” I grabbed the bowl from her hand and before giving my inner voice “Common Sense” a chance to speak up, I listened to “Troublemaker” and dumped her mac and cheese in her trough. 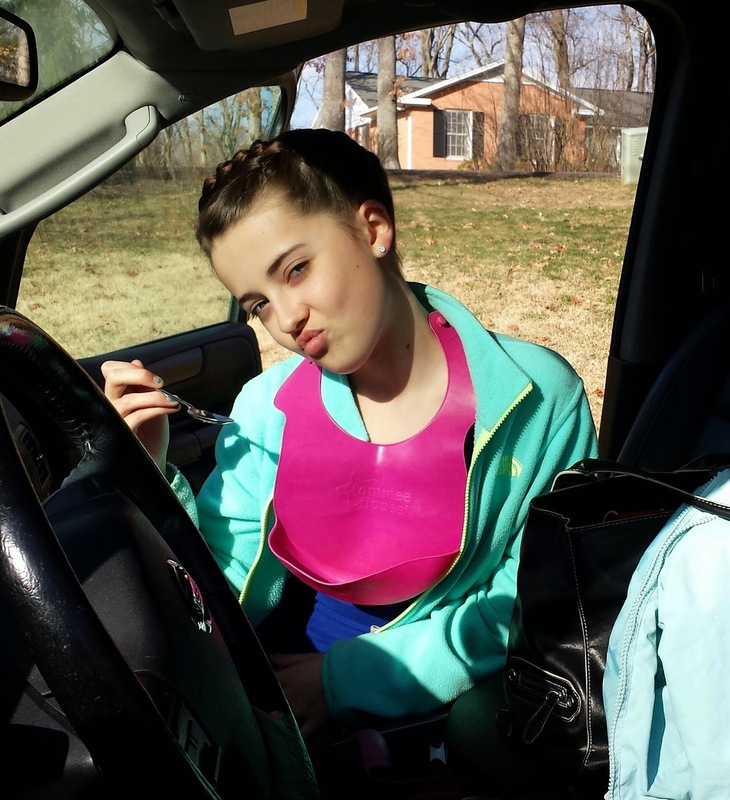 Before slamming the door I yelled, “try to keep a grip on that spoon Baby!” By the time we reached Sophia’s dance studio, Haley’s trough was empty, other than her spoon, which was neatly resting in the bottom. She was happy, full, and not a noodle on the floor! Das Feid Baug: on the way to AWANA at church! Das Feid Baug: on the way to dance! Great for adults too! 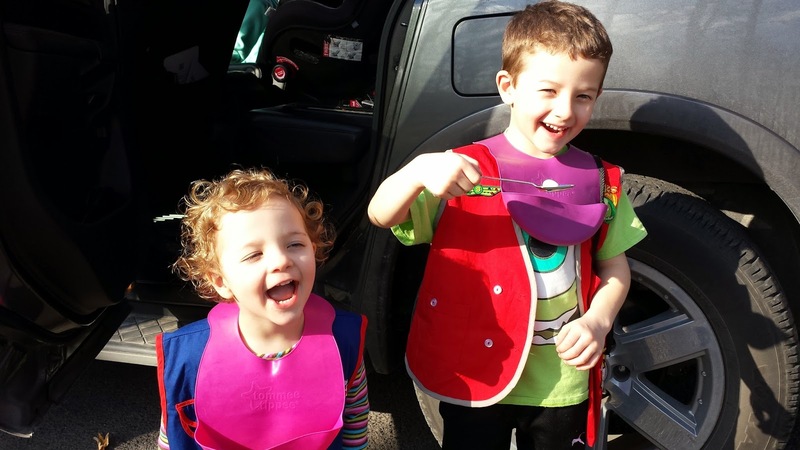 Creates a hand free eating environment for utensil requiring food in the car! You really only need one hand to drive after all don’t you? Das Feid Baug: for your hour alone on Wednesday nights!!! Pingback: D-COMP | Who Dried My Jeans? !